I have bought a Danst manifold and ZX6 carb kit to fit to my Blacktop Zetec (running MegaJolt). I see the manifold has a take off installed to the left which I'm assuming is for a vacuum or servo take off - do I need this? If not I'm guessing I can just block it off? Also, at the bottom of the carbs there is a connector that I'm unsure of - I know the one at the top is for fuel but what is the bottom one for? Do I need to connect it to something? Blank off the manifold vac pipe. Difficult to see from you pics but on bike carbs you often get a water feed from cooling circuit that helps with carb icing. So could be that. Or you can also get a breather to the float bowls. So could be that too. May the bottom be to pressurize fuel bowls in case of forced induction?? That would make sense. In my head all I need is to connect up the fuel as they are gravity fed - I'll run a pipe to mt catch tank for the bottom ones just in case they vent something somewhere! Just waiting for my bike fuel pump to turn up and then I can fit em! Bottom one is fuel feed to carbs. Top one is breather for the diaphragms under the plastic caps. This one is left to atmosphere on my setup. Can't wait now to get them on there! I'm told the carbs had been run and checked on a test rig prior to dispatch for balance, idle and free RPM pickup and so took the carbs off again yesterday just to check/count how many turns each pilot air screw was set at (most websites indicate 3 and 3 and half turns as being pretty normal as a base setting). I found carb 1 (the one I seem to have an issue with) was right out at 6 or seven turns - whereas all the others were at 3 turns. 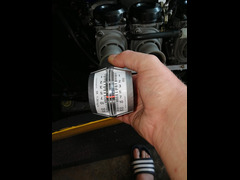 If I put my hand over carb 1, the engine idle will drop/die, but doesn't over carbs 2,3, & 4. Pick up is actually quite good, but the revs hang occasionally (although not always) which would typically indicate an air leak somewhere but I know it's not from the manifold or carb interface. Cylinder/Carb 1 is popping occasionally on tick over and in general the engine is really smokey/oily/rich, however Cylinder 1's plug is clean/dry, whereas 2,3 & 4 are all black and oily - anyone any other ideas on what else I should check ? You need to start off by balancing them. Make sure there is not something sticking number 1 open to begin with, if everything seems OK mechanically then balance them as normal. Do you know how to balance them? I can't see anything sticking number 1 open but haven't opened them up internally yet. They were supposed to have been balanced before they were shipped to me but either this was not the case or something happened in transit which I cannot rule out, only the package seemed intact and well wrapped. I have vacuum gauges in the garage but there are no take offs on the carbs or the silicon rubbers that came with it (nor on the manifold) to connect to, so will need to buy some bike ones with vacuum pipes on and use those, then switch back to the silicon rubbers. Even if it was out of balance, would it present symptoms like this though? I understand logically going through each step to rule things out though, just frustrating and time consuming. It's what I used to balance my carbs. And yes - the engine will run like an absolute dog if the carbs are out of balance. There is no reason not to use your air flow meter to balance the carbs, it may not be quite as simple as having 4 manometer's connected at once but it shouldn'the present any great problems. Out of sync carbs can cause rough running. Rev''s hanging on the over run can be caused by weak mixture, I would reset the #1 air screw to the same as the rest once you have balanced the cars. My rolling road guy used exactly the same flow meter as you have to balance my bike carbs. Get a base reading from carb 1 (carb closest to throttle cable attachment). Then balance carb 2 to carb 1, then carb 4 to carb 3, then carb 3 to carb 2. You might need to increase the idle speed to 1500 rpm ish to make sure the engine doesn't die when adjusting them. Make sure then carbs are all closed when checking the flow. When we were adjusting the screws on mine sometimes we found the throttle would open slightly causing the reading to be out. I've emailed DanST to check what the idle screws should have been set to and was surprised to hear that one of the idle screws was right out - they said they set them all to be 2.5 turns out as standard when balancing them which makes me think this set may somehow have missed part of their quality control, anyhow, I also mentioned to them that I can cover carbs 2,3 & 4 with no change in revs to which he thinks would suggest air is being pulled in on that cylinder somewhere - I can see the logic in that, however cannot find any trace of a leak by spraying carb cleaner and WD40 around the manifold area to see if it would change the revs at all. Increasingly I am thinking the carbs must be so out of balance that carb 1 is making the engine continue to run on even if I do cover the other 3, so think the next thing to try is balancing them. Davedew has said which carb to balance with which (thank you), and I have set all the screws to be 2.5 turns out as DanST suggests they should have been - I will let you know how I get on! Balance them first! mixture screws won't affect the balance. Unless bike carbs are different? I don't think you can balance a set of carbs off the engine they are going on can you? But balancing should be the first thing you do then start with all mixture screws the same and go from there. Not 100% sure but you should be able to them pretty close although of course there are so many variations at play on different engines I can't see how you could either. Anyhow, made a big leap forward yesterday - I set the pilot air screws to be the same across all 4 carbs (2.5 turns out) to give me consistency across the carbs as a starting point and then had a go at balancing them using my flow meter and the method suggested above - what a difference - it started to run a lot better but was still belching out rich fumes so turned the air screws in a turn and that helped massively - tweaked the balance a bit more and then with another 1/4 of a turn in it's running much smoother and without a whole load of fumes coming out - I ended up with the idle screws turned out at 1 and 1/4 in the end. It's at a point now where I think it's driveable to get it to the Dyno session next week where they can properly set it up - I could have done without spending a few quid trying things in the belief they were balanced but in the end I learnt a lot thanks to the help of folk on here! Thanks folks - much appreciated! Glad you managed to get it running a lot better. At least now you can drive it to the rolling road to get it setup properly. I know mine runs slightly rich at idle. Initial throttle opening leans the mixture out. I also found that I needed to richen mine slightly as when cruising at high speed with little throttle it was slightly hesitant. You could feel a slight judder. Adding an 1/8th of a turn out on the base mixture screws sorted that out. Also if you need a map for the Megajolt let me know, and I can email a copy of mine. Cheers Dave - a copy of your map might be of use to compare!